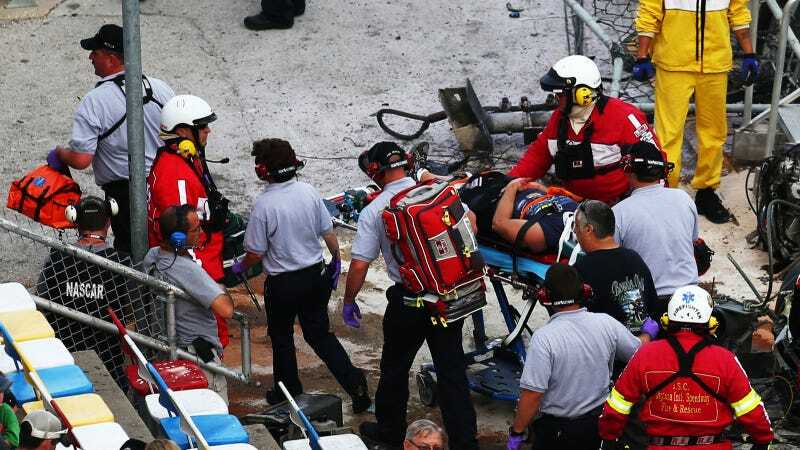 A day after Saturday's horrific crash at the Nationwide Series DRIVE4COPD 300, seven people remain hospitalized in stable condition, according to medical officials in Florida. The Associated Press reports that the seven people in a Daytona Beach hospital are all in stable condition, which is excellent news. Six others were taken to another hospital in Port Orange after the crash, but they have been discharged, according to officials. Florida Memorial Medical Center officials won't release information about any patients that may be at their hospital. As we told you this morning, one driver, Michael Annett, was kept overnight at a hospital for observation after he complained of chest pains, but he was released this morning. The AP said a total of 33 fans were injured when Kyle Larson's car went airborne after a crash and rained debris upon the crowd. Fourteen were treated at the track and the rest were taken to area hospitals or went there themselves, officials have said. While the crash was certainly a terrible one, the good news (at least so far) is that no one has died as a result of it. Let's all hope it stays that way.